While checking out the local/regional shelves at Lemuria Books in Jackson MS (yes you need to stop in there if you are a booklover. And if you live around Jackson, I might even suggest a nice trip one hot weekend to spend a half day in the bookstore, some time in the Fondren co-op and maybe a stroll through Eudora Welty’s garden), I spotted this large book facing out, published last year but one that I had not heard of previously. The title was underwhelming, but the subtitle did intrigue me, as did the identification of it being the same author as Matzoh Ball Gumbo, which I had read and appreciated. 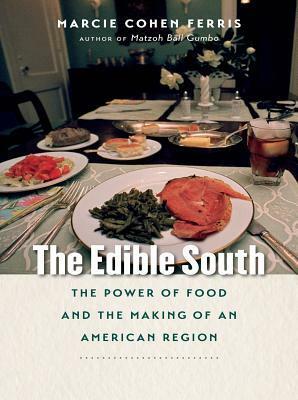 The book is broken into 3 sections: antebellum and post antebellum Southern food (“Plantation South”), late 19th c/ early 20th c (“New South”) and post 1950 (“modern South”), which is a very useful way to think about food and folkways in any American region actually. Each section has fascinating information about growing food or cuisine and uses scads of citations from prior research and popular books to showcase each. The author, Marcie Cohen Ferris is a professor of American studies at UNC Chapel Hill and is well known among local food activists across the South. She has taken a wide view of Southern food since Jamestown days, using a great many of our most respected scholars work to weave a compelling and absorbing narrative. What is tricky about the long history here is the need to address earlier inaccuracies and overt racism embedded in some of that scholarship. The author does a deft job addressing those shortcomings without deleting what is useful from her predecessors’ work. The Plantation South section was less comprehensive than I had hoped, especially knowing the beginnings of my own region around New Orleans as a tobacco company for the French, which has led to a commodity and export agricultural system that extends to this day. I had hoped for more about that era and more details of the enslaved and forced labor system of the Southern agriculture system, but it is quite likely that the scholarship was just not there to use. The New South section should be required reading for any researcher or embedded activist working in the South. The founding of the Extension Service, of the home economics and demonstration movement and the research into healthy foods to reduce diet-based illnesses across the impoverished South are examples of the rich tapestry Cohen Ferris does explore and, for my money, is the best part of the book. Many times, I found myself referring to the notes and bibliography to record the name of the book she refers to in the section. Additionally, I much appreciated the section on Old Southern Tearooms and the account of the deliberate development at the turn of the 20th c of the myth of the genteel South, where a “southern narrative of abundance, skilled black cooks, loyal servants and generous hospitality of gracious planters and their wives” was displayed at places like Colonial Williamsburg, Charleston and of course New Orleans and as a result was completely accepted as the true story of a much more complicated and less romantic time. I certainly hope that her detailed work here separating fact from fiction may help put these embellished or completely fabricated stories of the “old South” in their proper place. The Modern South section adds history on civil rights (how does it relate to food you say? lunch counter sit-ins, men’s-only lunch rooms anyone? ), and history on federal programs like national school lunch program which are thoughtfully offered. The pieces on organizing natural food coops and buying clubs were so very welcome as little is available in popular research about how important these efforts were to the beginnings of the current local food/farmers markets) movement happening today. That leads to my main disappointment with the book – the scarce information on the farmers market/community garden movement of the 1970s-1990s, much less over the last 25 years which has been a dizzying and somewhat gratifying time for food sovereignty work. I can understand how the author was able to extract more from the researchers and writers of the Southern food system who focused on home cooking rather than to the (largely) nameless and transient activists and ideas of those same systems, but still, much has been written in the last 45 years not covered here. I can only hope for another book from this author that has the same level of detail, covering the last era from a grassroots or even a policy point of view. In any case, as I told a market leader in one of those vibrant places of local food in the South, this book is definitely a keeper and one destined to be used extensively among researchers, activists and policy makers. I might recommend that some of you utilize these suggestions within your market or grassroots food community efforts. Often, these type of collaborative public space efforts can extend the food community vibe into new arenas and into becoming a “beloved institution” beyond the hours of the bell or the garden fence. 5 Small Town Stories of Lighter, Quicker, Cheaper Community Action | Citizens' Institute on Rural Design. As a member of Farmers Market Coalition’s research team, I for one am very excited to receive this support from the Knight Foundation and their Prototype Fund. This pilot will allow FMC to listen to markets’ needs and ultimately fashion dynamic solutions to upload simple data (customer counts, number of new products offered, staff time dedicated to outreach for at-risk populations) to then see that data in an appealing info-graphic style for use with market partners as well as to see it aggregated on a national map with other markets data. 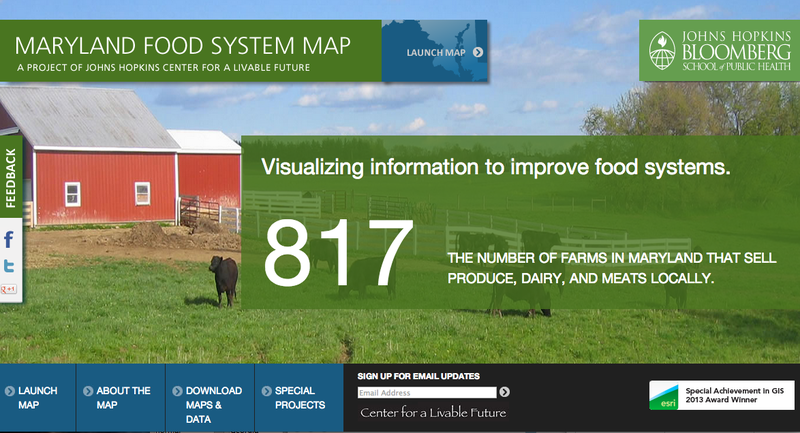 Please let me know if you have ideas or experience in data work in your market that may lend itself to iterations of this prototype and please look forward to more information throughout the year on this Farmers Market Metrics work happening at FMC. Great article about the (negative) relationship of the food movement to gentrification and therefore culture. We have to know the entire history of our movement (including its elitist characteristics) and acknowledge how our work has positive and negative implications on the less fortunate even as we continue to push its boundaries. “Much of what we call food politics today—buying local, farming organic, eating vegetarian—originally came from collectives that wanted to raise awareness about industrially produced food. The People’s Food System of the mid-’70s was a network of community food stores and small-scale food collectives that organized to take back control of food from large agricultural and chemical companies; they built direct connections to farmers to establish the first farmers’ markets. Meanwhile, the Black Panthers were hosting free community breakfasts in their neighborhoods, and Alice Walters opened Chez Panisse partly as a space to talk about politics. Various collectives shared the urban farm known as the Crossroads Community (The Farm) on Potrero Avenue at the edge of the Mission.